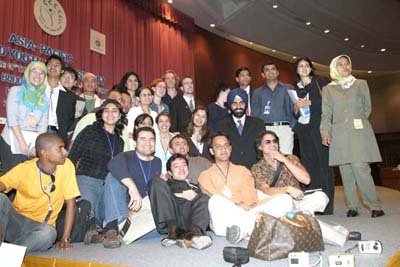 WYPS "World Youth Peace Summit"
Dead Sea, Jordan. September 11 - 15, 2006. "Peace Within, Peace With Each Other, Peace With Nature"
The Asia-Pacific Regional Summit hosted by Prof. Phra Thepsophon, Rector of MCU and Mae Chee Sansanee, Director of Sathira-Shammasathan, brought together hundreds of young people from all over the Asia and the Pacific Region. Relive the WYPS Asia-Pacific Regional Summit with Camilla Flatt, the Asia Pacific Communications Manager (in pdf), click here. Click here to view the Action Plan (in Power Point) for the Asia-Pacific Regional Summit. Copyright � 2003 WYPS.org - All Rights Reserved. Designed and Powered by: PlanetUtech Co., Ltd.